Au jus (pronounced "oh-ZHOO") is a simple sauce for roasted meats that is made from the meat's natural juices along with added stock. This au jus recipe is great for roast beef dishes like prime rib. But you can use this recipe to make au jus for roasted chicken, veal or lamb simply by substituting the appropriate stock for beef stock. 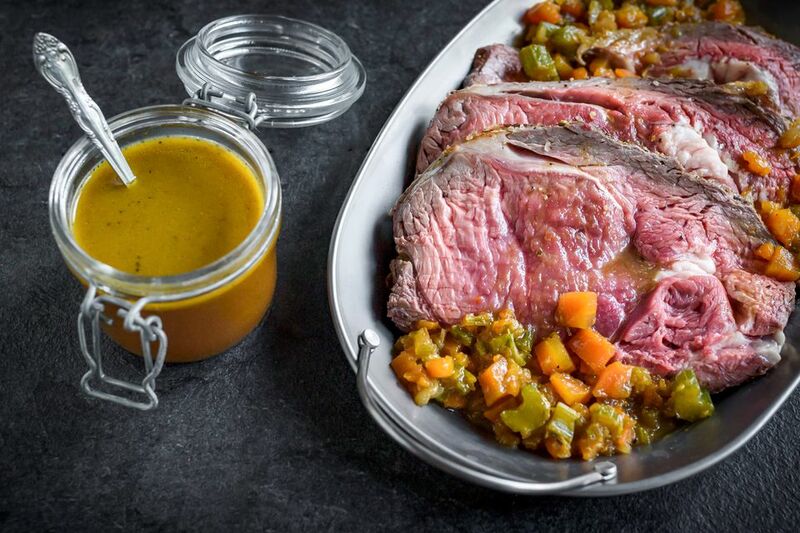 In any event, this au jus recipe assumes you have just roasted a large beef roast, as the meat juices and the little roasty bits at the bottom of the roasting pan are important components of the recipe. Here's a traditional prime rib recipe, which is particularly well suited for cooking larger roasts, like from 11 pounds all the way up to 18 pounds. For smaller roasts (up to 8 pounds), the closed-oven method will work quite well. The nice thing abut prime rib is that (unlike turkey) it's relatively easy to prepare it so that it comes out tender and juicy. Which means that (unlike turkey gravy) your jus is more for adding flavor than providing moisture. Place the roasting pan on the stovetop, across two burners, and add the chopped carrots, celery, and onion. Cook on high for a minute, stirring everything around with a wooden spoon, until the veggies are a bit browned and most of the liquid has cooked off — but don't let anything burn. Now pour in about half of the stock and cook for another minute over high heat, while scraping all those toasty bits (called fond) away from the bottom of the pan with your wooden spoon. Now pour the contents of the roasting pan into a large saucepan along with the remaining stock. You can keep it in the roasting pan, but the saucepan is the better of the two options. Simmer for about 20 minutes or until the liquid has reduced by about one-third. Now pour the liquid through a mesh strainer. For a finer strain, you can line the strainer with cheesecloth, but you don't have to. Let it sit for a couple of minutes so that you can skim off any fat that rises to the top. By now your roast will have finished resting and will be ready to carve. If the roast has thrown off any additional juices while it rested, stir these into the sauce. Serve each portion of meat with 1 1/2 to 2 ounces of au jus sauce. A fat separator like this one can be useful for separating the fat from the meat juices, so that your jus isn't too greasy. Keep in mind that au jus is not a gravy, so don't expect a thick, heavy sauce.